to be added, but labeled with a 3 just to confuse you. 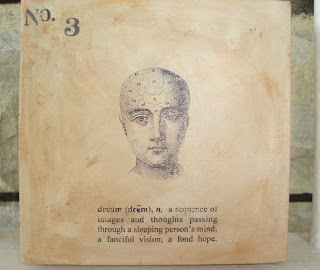 I just love this little canvas and it is decorating the shelf above my desk just now. I watched a personal marathon of House today - popped some dvds in and thoroughly enjoyed the snarky humor. I can't wait til the new season starts. Also watched was 'Miss Pettigrew Lives for a Day' which came in the mail. Not bad at all, though a bit predictable and mushy. I can take that when it means a happy ending, though - I'm a sucker for those. 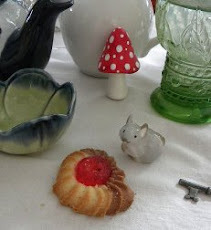 I've updated with three new items and they are nothing I've blogged about so far. All new and so very, very cute. Check 'em out!! I'm having a fairly good weekend so far. Yesterday we went to the Greek Festival at my church, St. Nicholas. They have the best shish kabobs, pilaf and spanikopita ever. Mmmm... It's not too cheep and its always really crowded, but that's because it is soooo worth it. Today is spent working around the house and taking pictures, uploading, etc. Hopefully tomorrow will be more fun. 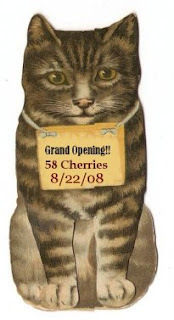 This morning was spent in fruitless search of a good garage sale or rummage sale and now the evening is spent lounging with my kitties in bed while surfing the web. Such a lazy day. I'd better go check my tomato plants soon, though, I've neglected them a few days and they must be bursting with ripe tomatoes again. 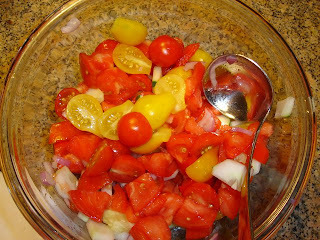 It has lovely cherry tomatoes and beefsteak tomatoes and little yellow heirloom tomatoes all from the garden. Yum. A touch of red onion, cucumber, oil, lemon, red wine vinegar, salt and pepper and you have delicious summer dish. 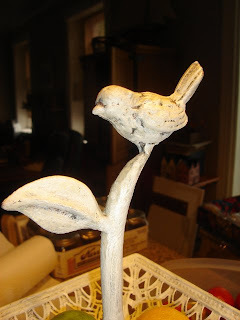 I got the little stand at Hobby Lobby and it is so cute with the little birdie on top - it was a depressing gray when I bought it so I painted it white, but left it rather antiqued looking. 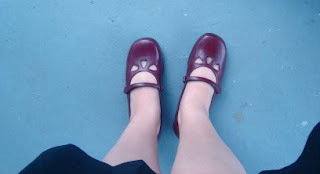 And here is just a random pic or two of my shoes, just because I'm clearly obsessed with mary janes. I got these at Payless years ago, but kind of forgot about them until now. Oh, and I posted another sheep pic at my store, btw. Finally, I can announce that my shop is open - yay! Only three things so far in there - not much of an opening, but it is a start, right? I'll be adding things now whenever I can. Please take a look if you haven't already. 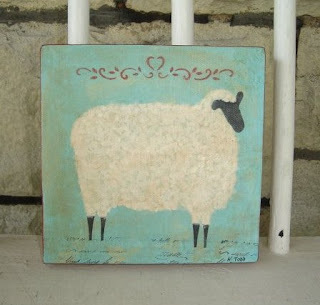 This is a mixed media folk art sheep - it's on a really nice 6x6" canvas and has been painted, stenciled, stamped and some collaged paper underneath giving it some texture. The grass he's standing on is a script of French text. It's so darn cute it makes me smile everytime I look at it. How quickly a week flies by. I meant to post several times and life just swallowed me up. I did get some painting done this week, but they still need a few details and to scan them. I find that my printer is woefully inadequate to make prints of my work and I'm wondering if I should buy a new printer or take the paintings to a printer to have them done nicely?? Would Kinkos work? If anyone reading this has advice please share it. It's hard to get the colors as vivid and my printer leaves lines in the picture even with a new ink cartridge. 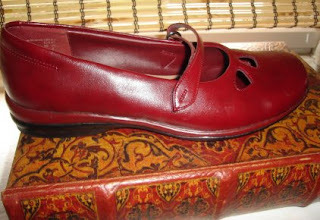 Cute little rounded toe maryjanes with a side buckle. 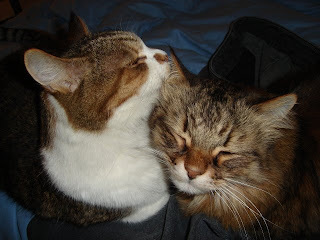 My kitties being ever so cute as they lick each other's faces. 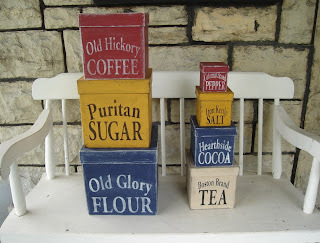 And a set of Primitive Kitchen Canisters I made to sell. I've sold some on ebay in the past, but I'm thinking of posting this in my etsy store very soon. They look cute any way you stack them or you can store them all in the biggest box and tuck it aside or ship them easy. 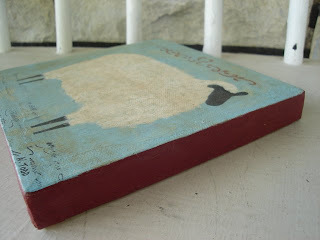 I've painted them inside and out in great primitive colors, stenciled them front and back and then antiqued them and gave them a matte finish to seal them. Thought I'd post a few pictures from around my house the past few months. 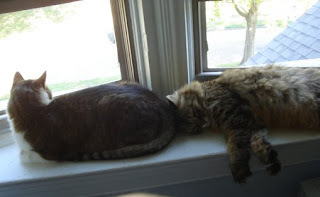 Here are two very lazy cats soaking up the summer sun in my window. 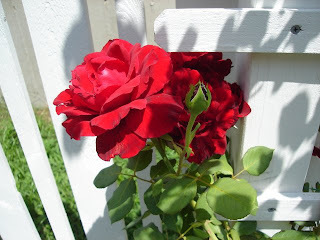 I have few different rose bushes, but this one is the most beautiful and fragrant. It's a Don Juan rose. It's climbing my white picket fence right now. A very romantic rose. A picture of part of my living room mantle. 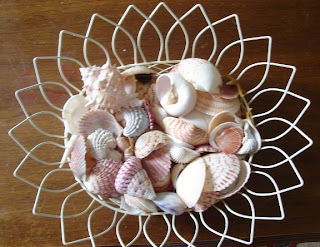 It's displaying my summer decorations just now. 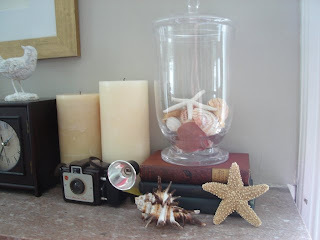 Seashells, old books, a vintage camera, candles, etc. 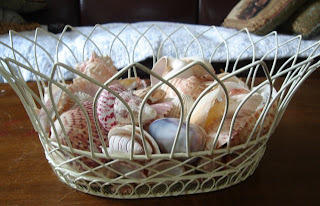 On the other side is a model sailboat and a larger container of shells and a few other bits and pieces. I love decorating my mantle and I go all out on the holidays, especially Halloween and Christmas. 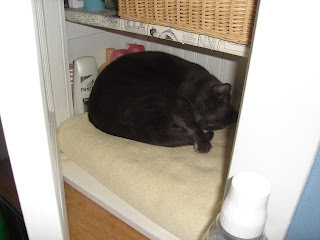 And finally, my other kitty who snuck in to take a nap in the bathroom linen closet. He's so darn cute I can't be mad at him. He gets away with lots of things that way. 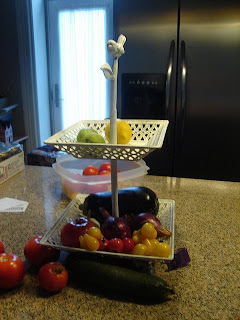 I spent the day out shopping for fresh fruits and veggies at a local farm and another fruit stand today. My mother is planning to make homemade pickles tomorrow. I'm not sure how I feel about that - last time she did it the house stunk of vinegar. 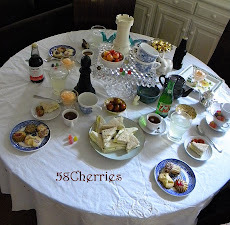 I'd much rather make jam. They combine so many things I love, 30's style, polka dots, flowers, cute little button straps, the rounded toe. I love, love, love them. Too bad I've yet to wear them. *sigh* The curse of a shoeaholic with nowhere pretty enough to wear their shoes. 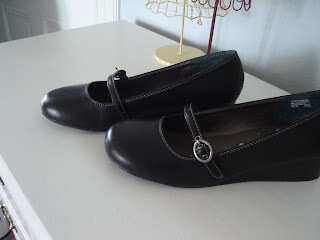 They look rather black in the picture, but they are a really pretty navy blue. They're Madden Girl shoes - I find so many of those shoes cute as a button. I'll just have to make an occassion to wear them, I guess. Today promises to be a scorcher here in St. Louis and I'm going to be laying low today. I have tons of weeding to do outside and tomatoes to pick, but it'll all have to wait til it cools off a bit. 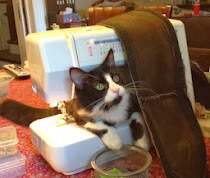 An excellent excuse to play with my art supplies, really. I'll post a pic of my other little painting I finished later. If you are in a hot area today stay cool and drink plenty of lemonade! Isn't she cute? I just love her little hood and you can glimpse Granny's house in the distance with smoke coming from the chimney, she's waiting for her little granddaughter to visit her. This picture doesn't quite do it justice, it's even nicer in person with the sides painted the same dark red of her cloak. I'll be making prints of this to sell in my Etsy store as soon as I test out the new paper I bought to do that with. I have another little picture to post soon of another little girl I painted, not from a fairytale. Back on the subject of Red - if you're as interested as I am on all images related to her you must check out the Little Red Riding Hood Project. 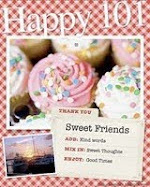 Great way to find cute images of our favorite little fashionista and check out all the variations of the tale out there. I'd love to have some copies of these old tales. I must look into buying some.